Earlier today, I talked about presidential photo-ops; and how the right picture could give a candidate the edge over their competitors. 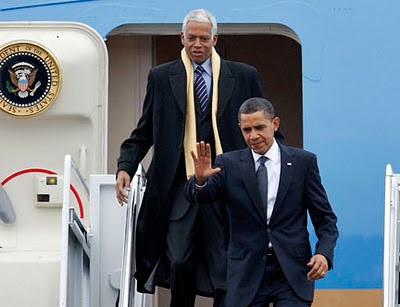 Hank Johnson, the Congressman from Georgia's 4th district, was on-board Air Force One as President Obama traveled to Savannah for another stop on the White House to Main Street tour. Johnson was rewarded with a picture of him and the President bounding down the steps of Air Force One en route to a speech announcing more details of the Homestar Energy Efficiency Retrofit Program. Wednesday morning, Congressman Johnson's constituents will open their newspapers, see the Associated Press photo pictured above and suddenly, the already high stock of Hank Johnson will go through the roof. The 4th district of Georgia is one of the most Democratic districts in the state. President Obama won the district handily in the 2008 presidential primary, and he continues to receive high marks from voters there. The image of Johnson and Obama departing the presidential plane will have the intended effect of suggesting to 4th district voters that --among other things-- Hank supports Obama, and Obama supports Hank. In a race that features a former DeKalb County CEO and a sitting DeKalb County Commissioner, Hank Johnson's picture with the President likely increased the edge he has over his opponents. It's likely that voters will see the picture again on campaign literature later this year.